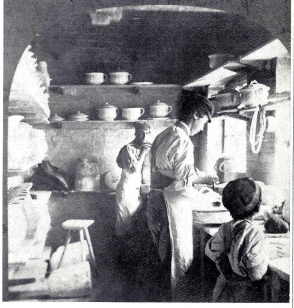 "The Potters' Art, Plate Making"
Throughout most of England’s history, the manufacture of ceramics was a humble cottage industry based upon individual potters producing utilitarian wares for a limited geographical region. However in the dawning years of the eighteenth century, great waves of change began which would continue through the nineteenth century. This change touched every facet of industry from an increasing understanding of chemistry to improved technologies. Modern organization of the work force evolved as the individual all-purpose shop was transformed into task based, multi-department factories. Networks of transportation including both canal and rail provided quicker means to safely and efficiently transport wares to distant markets. An entirely new view of ceramics emerged expanding the perspective to include decorative objects as well as traditional utilitarian wares. Finally, on the market side of the equation, shifting religious views and expanding wealth created new demand at every level, but especially for decorative ceramics. In this discussion, we take a close look at an alphabet plate depicting “Plate Making” from a series titled “The Potters' Art.” This series celebrates the modern ceramics industry from around the second half of the nineteenth century. We will look at the view, possible sources for the series, the class of ceramics to which this series belongs, and factors precipitating the creation of this class of ceramics. Robert Copeland describes the plate making process in Manufacturing Processes of Tableware during the Eighteenth and Nineteenth Centuries (1). 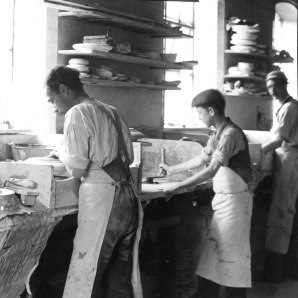 The three people shown on the plate represent the typical team engaged in this step of ceramics production: plate-maker or presser, wheel boy or jigger turner and mould runner. In the process known as jiggering, the plate-maker shapes the plate from a ball of clay prepared by an assistant. In both views above, the plate maker has literally thrown the ball of clay down on the center of a mould placed on a slowly revolving jigger-wheel. From this ball of clay, the plate will be formed, face down. As the wheel rotates, the plate maker checks the clay for even distribution while modeling the rear profile and table ring. Any relief decoration on the face is created as the clay is pressed on to the mould. 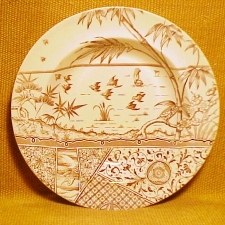 Once the form is complete, the plate maker cuts away any excess clay. The assistant facing us is the mould runner. As soon as the potter completed two plates, the mould runner would carry them to a heated room called a stove. 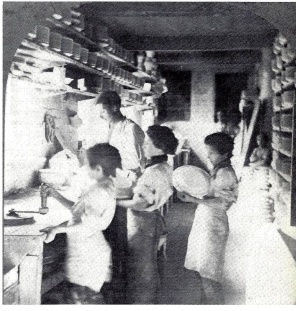 In the stove, he would retrieve two additional moulds with dried plates on them to take back to the shop. The dried plates would be placed in short stacks of three or four plates on a work board to await the next step in the process. The moulds would then re-enter the cue enabling the process to continue without interruption. The third person, with his back to us is the wheel boy or jigger turner. The wheel boy kept the wheel revolving by turning the handle on top of the bench. This handle was attached to a belt beneath the bench which in turn connected to a pulley on the end of the jigger head. The rate that the wheel turned originated with the jigger turner. In addition, the plate maker could speed up revolutions of the wheel by applying pressure to the belt via a lever controlled by his leg. The plate-maker was paid by management on a per piece basis. The assistants were employed by the plate maker who paid them out of his wages. In her work on childrens china, Gifts For Good Children, Noel Riley has assembled a group of nine views from “The Potters' Art” series. Views include: Slip Making, Turning, Transferring, Plate Making, Printing (two versions), Cup Making, Throwing and Packing. Taken together, these views give us a general impression of ceramics manufacturing from around the second half of the nineteenth century. Riley notes that the views correspond to a set of 1860’s stereoscope cards. 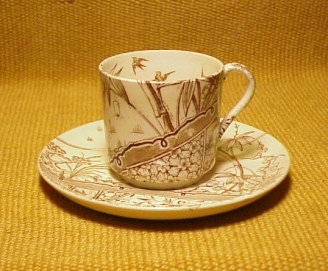 The two shown below come from a sampling published by Geoffrey Godden in Staffordshire Porcelain. Comparison of the plate maker view (left) and holloware maker view (right) with the view as executed for the plate reveals some artistic license in adapting these images for the series. Note how one mould runner appears to be waiting for a second plate to take to the stove while the second mould runner waits with mould in hand, ready to be placed on the wheel. “The Potters' Art” series belongs to a larger group of novelty wares familiar to most collectors, but which has never been defined or given a general name. While there is a temptation to lump them all under the “Juvenile” category, they cover a much broader range of subject matter. What they do have in common is their decorative, rather than utilitarian, function -- and their affordability. Prior to this period, decorative ceramics had been the province of the aristocratic classes. While there are examples of this sort of affordable novelty wares from the early nineteenth century, in the 1830’s, a surge in these wares began which continued through the century. This growth parallels that of the middle class and its increasing financial means. Despite a wide diversity of subjects, these wares share the general characteristics listed below. Content Far beyond the boundaries of nursery wares, subject matter ranges from the purely decorative to historical, commemorative, religious, political, didactic and even celebrity – a range of content, often more relevant to adults. 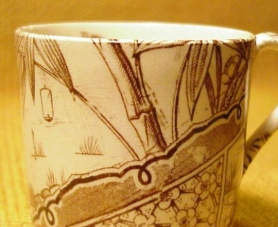 Earthenware Porcelain is encountered occasionally; however most items are earthenware, the easiest and most common ceramic body with which to work. Size Most items are a size convenient for both children and adults. 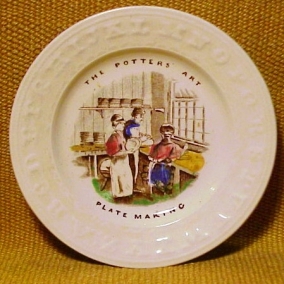 Plates in “The Potters'Art” series range from 5 ½ to 7 ½ in. diameter. This example is 5 7/8 in. Anonymity The majority of these wares are unmarked. Most manufacturers seem to have had no interest in being identified with them. Decoration Multiple types of decoration were used; enamel, luster and transfer – sometimes with quickly applied enamel highlights. Multiple moulded border patterns appear in addition to the alphabet border used here. All share the attribute of quick and easy production with primary emphasis on quantity. Art/Subject Given the broad range of subject matter, the fierce competition among potteries, and the ease of copying published material, the sources for artwork can often be traced to published, copyrighted work. Noel Riley notes that the lack of identifying manufacturer’s marks may have provided convenient cover to avoid legal issues over the use of copyright material (2). Price Affordability was key to the success of these wares. Assortment While the array includes any item which could be produced at a “cheap and cheery” price point, they tend to be individual as opposed to tea, dinner or dessert services. This array includes little vases, mugs and cups with saucers, but the majority of wares we associate with this category are plates. Distribution These wares were not found in fine china shops or luxury emporiums, but seem to have been distributed through seasonal souvenir stands and peddlers traveling the countryside to open air markets, to events and even from door to door (3). (Obviously for this distribution network, the low price point was an important factor minimizing loss due to breakage.) With the rise of rail travel from the mid century on, many were sold as souvenirs of holiday excursions (4). In Household Gods The British and Their Possessions, Deborah Cohen documents shifting nineteenth century consumer patterns which may explain the appearance of these wares. Her insights narrow down to two complementary factors, religion and money (5). From the late eighteenth century through the middle of the nineteenth, the middle and working classes struggled with income levels bordering on subsistence or worse, a condition which would not see significant change until the 1840’s. On the continent, these conditions bred revolution. In England, religion in the form of Methodism provided the antidote – or at least a temporary panacea. Methodism ministered specifically to the country’s laboring, struggling poor. It turned the austerity, suffering and self-denial of the lower classes into testaments of faith in God. The struggle to survive became virtue. With Methodism, the display of wealth brought one under the harsh scrutiny of one’s fellow believers as evidence of worldly materialism – sin. 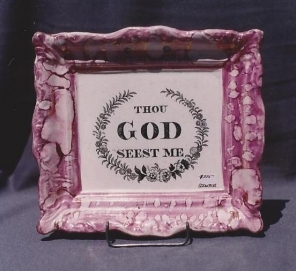 Indulgence in decorative objects, if at all tolerated, would be limited to those bearing moralistic messages such as the stark Sunderland motto plaques. Toward the 1840’s, with the rise in income levels, this austere religious philosophy started to wane. The view of wealth was transformed from something to be hidden or given away to the visible rewards of a productive Christian life. Consumerism flourished! Cohen notes that between 1851 and 1901, income per head doubled. The middle class population surged from 12.5 % in 1851 (a figure which had held steady since 1800) to 25% by 1901. At the same time, costs of necessities, especially food, plunged (6). The result -- more people had some money for extras. The response -- inexpensive, decorative objects provided an immediate, convenient means to enjoy this new sense of wealth. Chief among the trifles were inexpensive, purely decorative plates such as “The Potters'Art” series. As English potters realized the response to these purely decorative wares, new subject matter, secular as well as religious proliferated. “The Potters'Art” series represents more than the new genre of inexpensive decorative plates or the shift to secular subjects. It is an expression of pride – for the potter, pride in what they can now accomplish; for the consumer, pride in what they can now possess. 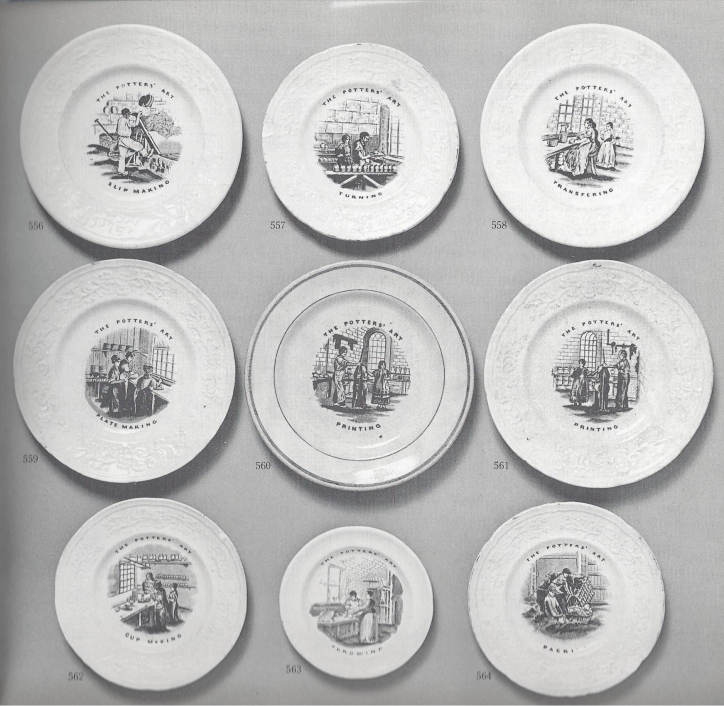 In both cases, the pride stems from the industrial progress responsible not only for the creation of the plates, but also for the creation of a market for those plates – pride in a phenomenon strongly identified with being British. 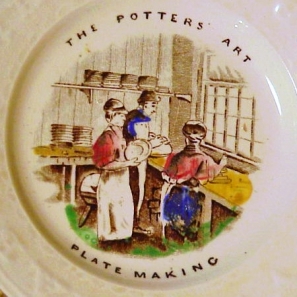 (To access the website listing for "The Potters' Art, Plate Making" alphabet plate, click on the plate photos above or copy the link below into your browser). 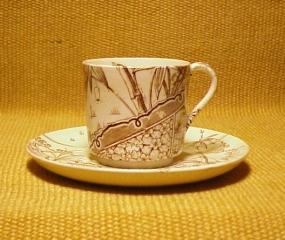 Here’s a look at a piece that will not ever be one of our offerings, a demitasse cup and saucer that aesthetic collectors will recognize as the familiar “Melbourne” pattern. It did not quite escape the danger of sale-by-auction and came to us with a saucer in need of a bit of attention. It was on its way to that storage area we sometimes affectionately call “Crack Land,” but we were stopped by a look at the cup. Instead of the plain border treatment of its fellow “Melbourne” demi’s, this little guy wore a bit of the elaborate pattern usually found on the plate—a strong diagonal intersected by a dramatic stand of bamboo. A second look amazed us. 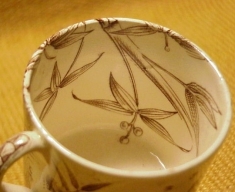 The transfer tissue with the bamboo had been folded over the edge of the cup creating a spray of foliage in the interior. We had never seen a transfer image manipulated in this way. Besides that, a few birds had been trimmed from the flock that hovers over Melbourne’s tropical scene and now fluttered inside the cup as well. Now we frequently point out that the goal of the transfer printing was to ensure the uniform quality of goods manufactured in quantity. How do we explain this fluke? Was this some sort of design experiment? Given the spontaneous way the tissue was applied, we prefer the fantasy we have conjured up. 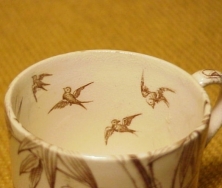 Perhaps some decorator had the opportunity—maybe “on the sly”—to play around with scraps of transfer tissue: “What if I do this…?” In our fantasy the decorator may have managed to keep the cup and saucer. Of course, if we hear that one of you has a whole set of these demi’s, our fantasy is blown. Nevertheless, we like to think we have a tiny human legacy from the industrial revolution—a personal glimpse of one worker on the line--like the finger prints of potters occasionally found on the surface of stoneware. In short, no residence in Crack Land for this new treasure. While we won't be offering this demitasse set--damaged, after all--there are some fine examples of the Gildea & Walker pattern currently available on the Seekers website. Click the image for details. Finally, should you want a little general background and discussion on this south seas fantasy, we have re-posted an earlier Featured Item on the "Melbourne" pattern -- click "next" below.